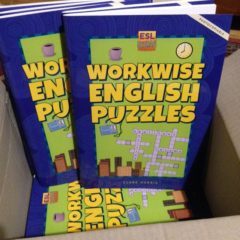 It took a year to produce, but finally Workwise English Puzzles is out and available in language bookshops! Like Extra Easy Puzzles, this book stemmed from my wish to create the kind of puzzles you might find in magazines. However, this time, I wanted to acknowledge the pre-employment English focus for so many of our lower intermediate to intermediate learners. It’s an interesting process trying to prepare learners for the world of (Aussie) work before they actually get work experience. I’ve taught English in various workplaces, where I could observe and analyse the workplace English around my learners. How do we prepare students for the ‘world of work’, though, when we’re not sure where they’ll be headed? Or prepare them for job-seeking when they haven’t reached that point in their lives? I really like resources that focus on general workplace language, and on informal and idiomatic English (so applicable to other areas of life). There are some great workplace English resources out there, from places like AMES Australia, NSW AMES, and ELS. (I also like Lily the Volunteer because it helps with the most likely kind of ‘work experience’ open to learners.) Unlike these resources, however, Workwise English Puzzles isn’t ‘teaching’ language, but offering one more chance to ‘review and practise’. What’s in Workwise English Puzzles? Again, there are crosswords, downwords, quizzes, and a ‘board game’, all looking either at ‘workwise’ language, or at using English in a workwise context. I’ve suggested a level or ‘lower intermediate to intermediate’ – it depends on how the puzzles are used. I hope this resource can also be useful for learners who are already at work, but need more English language development. These learners should be aware that they need to use a pencil, and may need reminding of the value of crossing words off the word list. For some learners, using the letters from the shaded boxes to find a ‘new word’ will be a new concept. However, this helps them check that they’ve got the puzzle right, before they even check the answers. It’s also a little built-in reinforcement – an impetus to keep going.